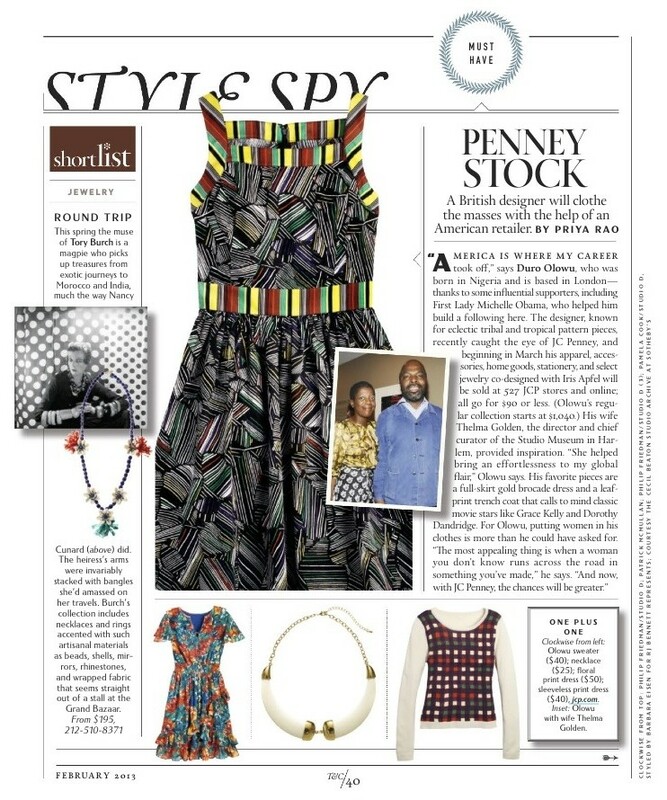 Harlem’s Thelma Golden and Duro Olowu featured in Town & Country Magazine | HarlemGal Inc. In the February issue of Town & Country, Thelma Golden, director and chief curator of the Studio Museum Harlem, and Duro Olowu, Golden’s clothing designer husband, are featured in the affluent magazine mentioning that Olowu has inked a deal with JCPenny where his clothes, accessories and other items will be sold at JCP and online starting this coming March-all for under $90. Very cool. And apparently our First Lady Michelle Obama is a big supporter of Olowu. Double cool. To view the entire article, purchase the February issue of Town & Country. This entry was posted in art and culture, Community, entertainment, fashion, Harlem Food Bar and tagged accessories, clothing, Duro Olowu, Entertainment, fashion, Harlem, JCPenny, Photo by Town & Country, studio museum Harlem, style, Thelma Golden, Town & Country. Bookmark the permalink. I hope JCP lasts in order for this line to flourish. I hope so too. I wasn’t aware JCP was having problems? When did that happen? Seems like yesterday they just opened near 34th Street.